Similar to a burger but far spicier, an aloo and daal bun kabab is the proverbial Pakistani street food snack. 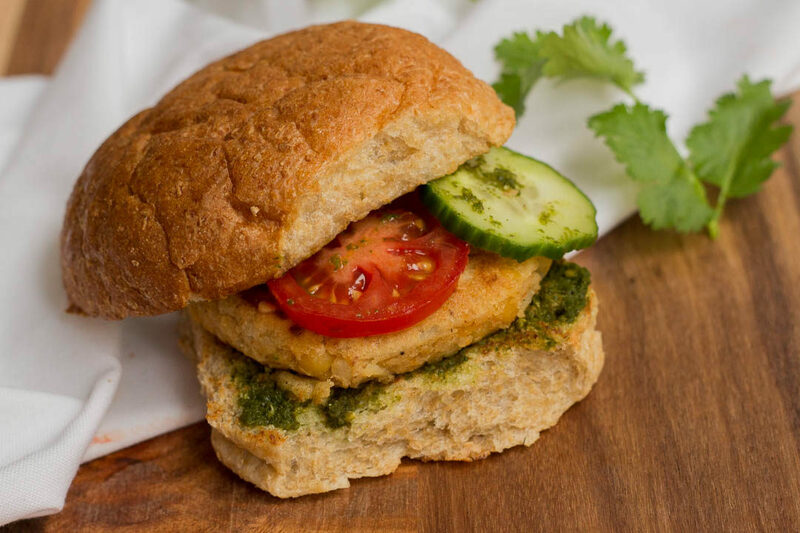 It features a potato and lentils patty in a tawa toasted burger bun, with lots of green chutney and sliced vegetables. I wait eagerly for Eid every year. The festivities, the clothes, family get-togethers and of course the food. I would spend days planning what I would make for Eid, determined to outdo myself from the year before. However, this year Eid is a bit different. I recently moved to Sydney, Australia and with no family and few friends, there is none of the hustle and bustle of Ramadan and Eid here. The first few days of Ramadan felt quite strange, but as the days went by it made me realize that instead of focusing on the things that used to happen in Pakistan, I should build my own traditions here. And of course, those are going to centre on food. That’s why my contribution for EidEats2018 is bun kabab, specifically daal and aloo bun kabab. Available at every street corner, bun kabab is the proverbial Pakistani street food snack with its masaledaar filling, lots of green chutney and that tawa toasted burger bun! 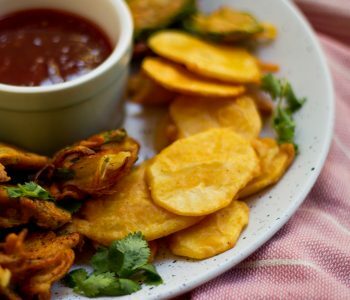 It’s a recipe that I wouldn’t make back home, but here it reminds me of Karachi, of times spent with friends and family, and thus is part of my Eid menu. 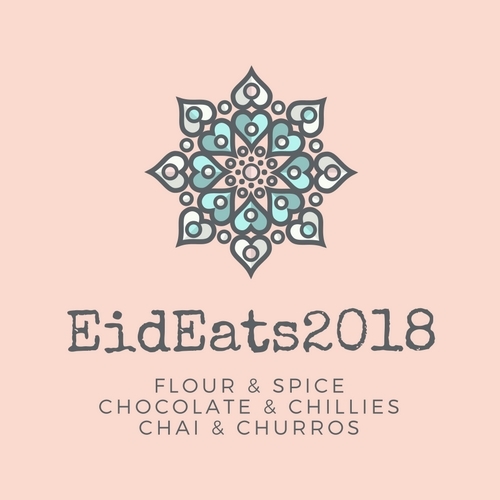 EidEats is a virtual one dish party hosted by Flour & Spice, Chocolate & Chillies and Chai & Churros to celebrate Eid, with 2018 being their 5th year of hosting it. The hosts and the bloggers participating in the party have shared some absolutely delicious recipes, savoury and sweet both. Do check them out here if you need inspiration for your Eid menu, or even your regular menu post Eid. If you want to participate in the activity, search for ‘EidEats2018’ on any of the hosts blogs, and you will get all the details! If looking for more recipes for Ramadan and Eid, just click here. If you are celebrating Eid away from family, do share in the comments below what you are making as part of your special menu for Eid. Similar to a burger but far spicier, a bun kabab is the proverbial Pakistani street food snack. 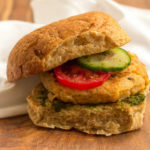 It features a potato and lentils patty in a tawa toasted burger bun, with lots of green chutney and sliced vegetables. Soak the split chickpeas/chana daal in water for at least 2 hours, and then drain. Place the soaked lentils in a pot with water, and bring to a boil. 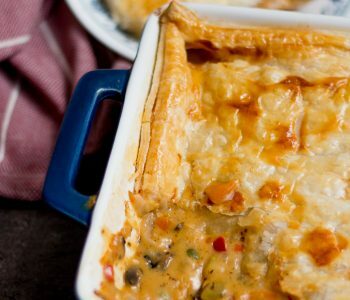 Cook for about 25 – 30 minutes, till soft. Drain, and set aside. Wash, peel and cut the potatoes in quarters. Place them in a pot with water, and boil till soft. Check by inserting a knife into the potatoes. Drain water, and place the boiled potatoes in a large bowl. Lightly crush the potatoes with a fork, and then add the soaked chana daal with coriander powder, red chili powder, salt, chaat masala and coriander seeds. Use a potato masher or a fork to mash the potatoes and the lentils, while mixing all the spices together. Once the mixture is combined, taste and adjust seasonings if required. Take out the potato mixture with a spoon, and form into round patties (similar to burger patties), and set aside. Crack the egg in a small bowl, and whisk. Dip the potato patties into the egg mixture and then fry till light brown and crisp on both sides. Fry all the patties, and cover with foil or keep in the oven to keep warm. Heat butter in the same frying pan or tawa, cleaning off the crumbs from the oil if required. Cut the burger buns in half, and then fry both sides of the bun till toasted and golden brown. 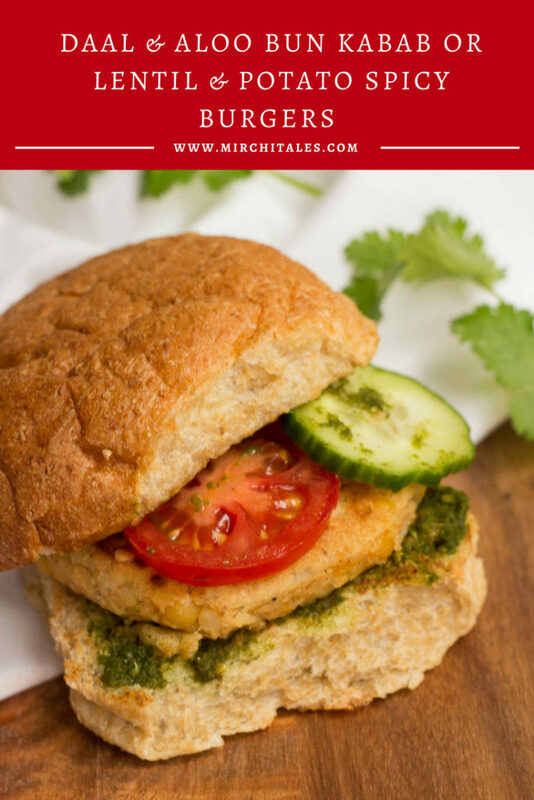 Assemble the bun kabab by placing green chutney on the bottom bun, then placing the potato patty and a slice of tomato, onion and cucumber. Top with tomato ketchup or chili garlic sauce, and then the top of the burger bun. 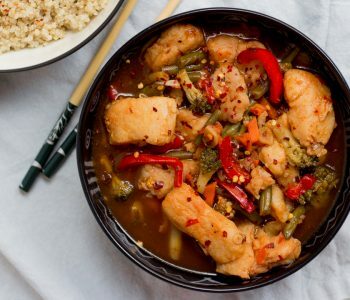 Serve hot with sauces on the side. To make green chutney, blend coriander leaves, mint leaves, green chilies, salt, lemon juice, crushed cumin and a little bit of water till smooth. Imli chutney or tamarind chutney To cargo or not to cargo PLUS what to take in cargo when moving from Pakistan? This Bun Kabab looks legit! pinning it to try! Looks delicious!! We have been wanting to try bun kebob but have yet to find one here in Toronto that we like. My husband grew up eating it but I didn’t and me and the kids have been intrigued by it. Will have to give your recipe a try! Thank you for participating in Eid Eats and I hope you and your family have started some new traditions in your new home! Eid Mubarak! Bun Kabab! This would be so amazing at an Eid party!